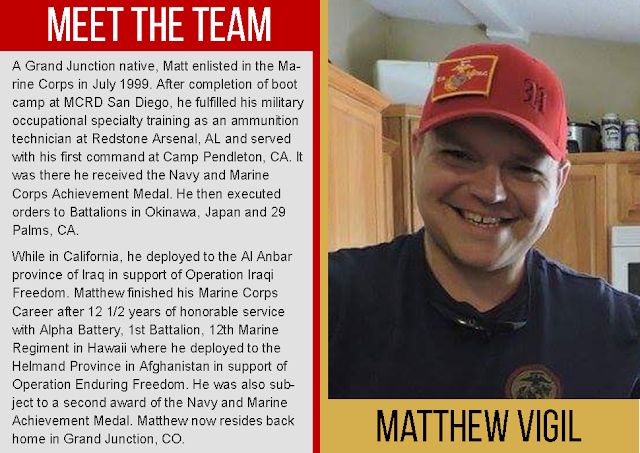 Meet Mesa County Motor Vehicle Customer Service Specialist Matthew Vigil. New signage in the Upper Grand Valley Pest Control District’s vineyards alerts visitors of the harmful grape pest. 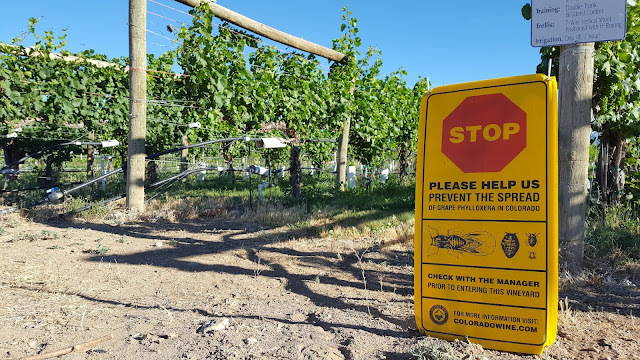 Vineyard tours may be restricted in order to prevent spreading these aphid-like insects to other areas. 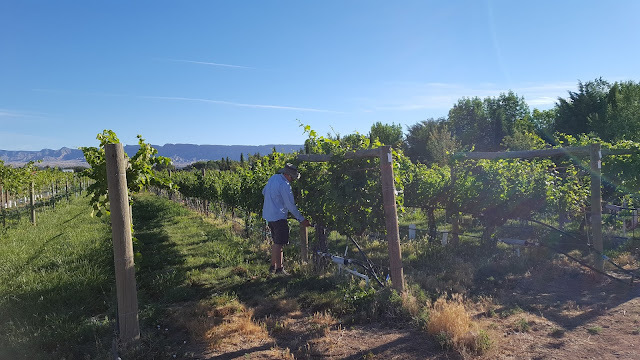 CSU Western Colorado Research Station Pomology/Viticulture Research Assistant David Sterle checks the irrigation flow in a vineyard on B 1/2 Road. The Upper Grand Valley Pest Control District (link here: http://www.mesacounty.us/pest/ugvpcd/) advocates for our commercial fruit growing industry including peaches, cherries, berries, apples, pears, apricots, and grapes. Mill levy fees help protect against out of control pest infestations by supporting research and education for growers and residents in East Orchard Mesa, Clifton, and Palisade to promote best management practices to care for your fruit whether you have one tree or one hundred acres. Keep our agriculture and agritourism strong by properly maintaining your trees, bushes, and vines! 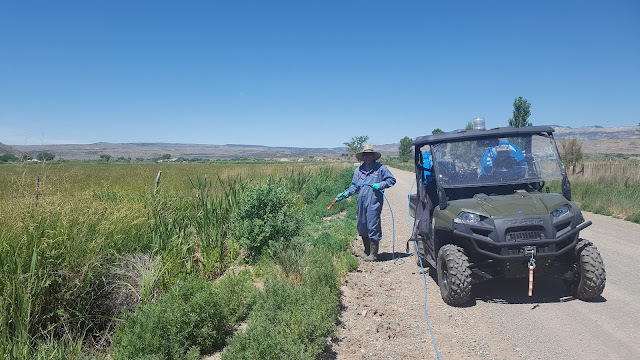 Noxious Weed and Pest Management staff member Alan Barbee treats noxious weeds on T Road in DeBeque. Spraying in combination with mowing helps keep rights-of-way clear for safety and weed prevention purposes. Childhood cancer is the number one cause of death by disease in children in the United States. Worldwide, over 160,000 children are diagnosed with cancer each year. The Board of Mesa County Commissioners proclaimed Saturday, June 24 as St. Baldrick's Day, and call upon residents to recognize the seriousness of childhood cancers and the exemplary work of the St. Baldrick's Foundation. Mesa County Commissioners Rose Pugliese, left, and John Justman listen to a constituent's priorities at the Community Coffee hosted in Mesa at the Blink Coffee Company, 10983 Hwy 65. The Mesa County Commissioners were joined by the Mesa County Assessor and other officials Monday afternoon in Mesa for a Community Coffee. Commissioner Scott McInnis and Assessor Ken Brownlee have a conversation with a resident of Mesa. Commissioner John Justman with a constituent. Great turnout for our Community Coffee in Mesa! Mesa County Commissioners dedicated Monday afternoon to hear from residents. A community member shares his priorities with Mesa County Administrator Frank Whidden at the Community Coffee in Mesa. Nathalie Ames, center, Blink Coffee Company owner, shares her ideas and priorities with Mesa County elected officials. Commissioner John Justman, left, at the Mesa Community Coffee. Community members were invited to casually converse with county elected leaders at the Community Coffee hosted at the Collbran Cafe, 108 Main St. in Collbran, on Monday afternoon. Commissioner Scott McInnis, left, talks to Collbran residents. Mesa County Road and Bridge Road Supervisor, left, and Commissioner John Justman, center, talk to citizens about road work. Commissioner Rose Pugliese, center, talks to the owners of Salt Creek Hemp Co, at the County Coffee in Collbran. 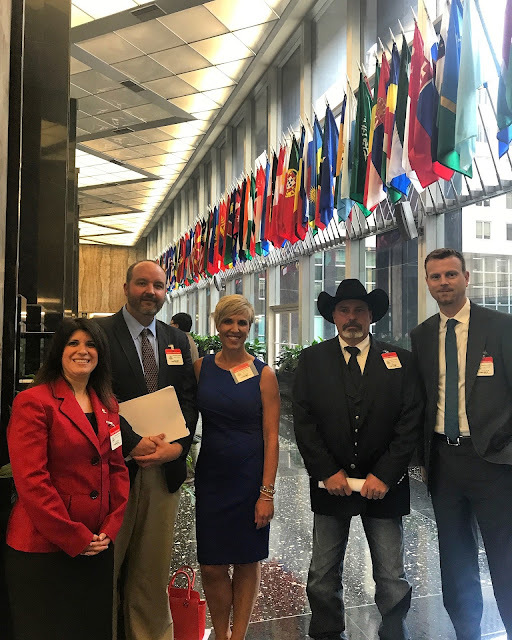 A delegation of Western Colorado community leaders traveled to Washington D.C.to meet with the U.S. State Department to advocate for the Jordan Cove project. 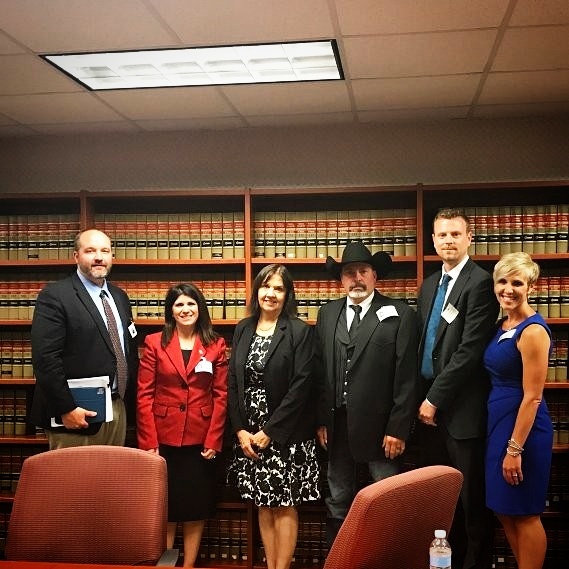 The delegation met with Federal Energy Regulatory Commission (FERC) Chairwoman Cheryl A. LaFleur. As Mesa County grows and changes, Grand Valley Transit wants to make sure that our bus system is reflective of the values, needs, and vision of our residents, employees, students, and visitors. Tell us what you think about Grand Valley Transit and the future of transit in Mesa County. 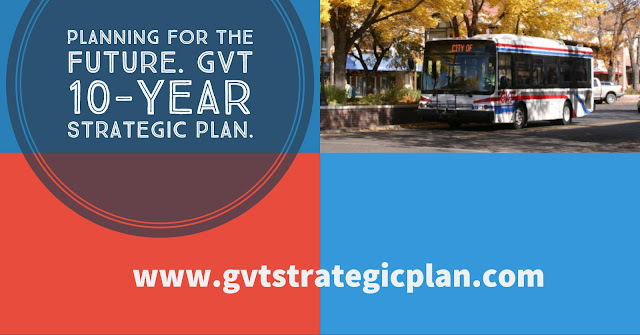 Go to www.GVTStrategicPlan.com to provide your comments on an interactive map, get project updates, and view documents and plans. Commissioner Scott Mcinnis talks to KREX News Channel 5 about the culvert replacement project at 27 1/4 Road near the entrance of the Book Cliffs pistol range. For more information regarding the project, visit https://goo.gl/oyH8YH. Commissioners approve the designation of the Collbran Auditorium as a Mesa County Historic Landmark at Land Use hearing on Tuesday. Mesa County Road and Bridge Road Supervisor, left, talks to the Inside Mesa County (IMC) class about the various road districts and how they operate in the county. Elections Director Amanda Polson, left, Clerk & Recorder Sheila Reiner and Motor Vehicle Manager Bobbie Gross get ready to present to the IMC. Mesa County Public Works Director Pete Baier gives IMC attendees a review of the operation he oversees. Mesa County Engineering Division Director Scott Mai talks about the status of the 29.5-E.63 Bridge Replacement project to the class. Mesa County Clerk and Recorder Sheila Reiner gives IMC attendees a close into the daily operations of the recording division. Elections Director Amanda Polson talks about the recent changes in processes and innovation in her department that have saved money. Motor Vehicle Manager Bobbie Gross tells the Inside Mesa County class that 30 percent of the transactions performed in the office continue to be renewals. The average in-office wait time for May was approximately 81 minutes. A Mesa County resident drops off unmarked liquids to the Mesa County Hazardous Waste Collection Facility for proper disposal. Mesa County Hazardous Household Waste staff members Beau Schmalz, center, and Shay Starr, right, unload and process the unknown liquids to send to the lab for identification. Dumping on the way to or near the landfill is not properly disposing of trash— it is illegal! In addition to the direct cost of litter removal, litter also harms the environment and affects property values and economic activity in our region. Please help us keep our beautiful Mesa County clean. A resident illegally dumped a pot full of rusted nails on the side of the road near the entrance of the landfill. Mesa County Solid Waste Director Barrett Jensen and Mesa County Solid Waste Operations Manager Amber Swasey pick up nails on the side of the road. An old, stinky couch and a pot full of rusted nails are removed from the roadside on 31 Road by Mesa County officials. Littering is never OK. Solid Waste Director Barrett Jensen and Mesa County Solid Waste Operations Manager Amber Swasey load up the couch to take it to the landfill. Perfect timing. 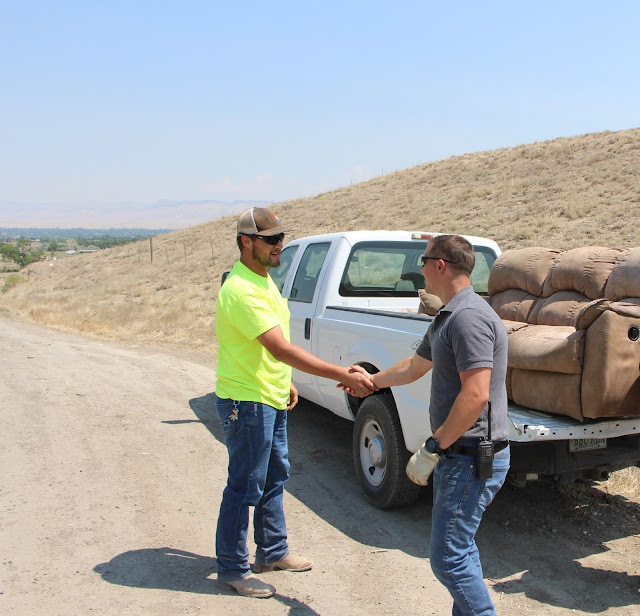 Mesa County Solid Waste Equipment Operator Cody Schmalz, left, runs to help Barrett and Amber load the heavy couch into the truck. Solid Waste Director Barrett Jensen thanks Cody for coming to the rescue and helping out. The couch is taken where it belongs: the landfill. Solid Waste Director Barrett Jensen and Mesa County Solid Waste Operations Manager Amber Swasey unload and properly dispose of the couch. Mesa County Hazardous Material Manager Hope Petrie explains to residents the many benefits of recycling and reusing to reduce waste. 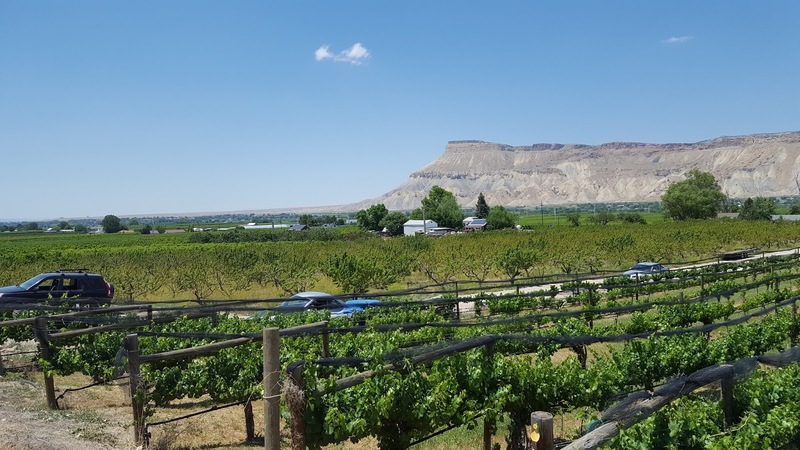 Mesa County Regulatory Compliance Manager Jennifer Richardson explains to the Inside Mesa County that her main job is to ensure that the landfill maintains compliance with all mandated environmental regulations. This portion of the Mesa County Landfill is expected to be filled with trash within the next twenty years. Organic Materials Composting Facility accepts leaves, grass clippings, tree limbs (<6' in length & <30" in diameter), hay, straw, cull fruit, stall bedding and manure. Ultra fine compost, is finely screened compost with a balanced microbial content. This compost is perfect for top dressing mature lawns, golf courses, and athletic fields. 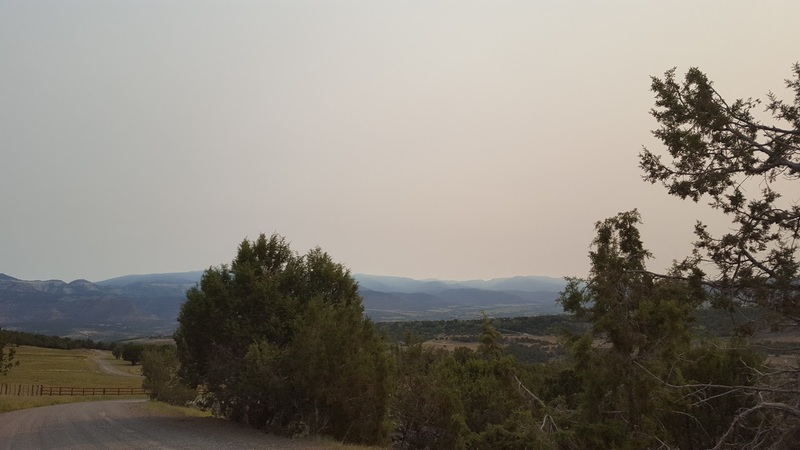 Haze over Plateau Valley on Thursday was attributed to the Brian Head Fire burning in Garfield County, Utah. Installation of a drain to the retention pond at the Mesa County Animal Services facility. Reinforcements are placed on the west side of the outer foundation of the Animal Services building. Happening today at the Animal Services building—installation of the subflooring supports and decking material. Today is National Take Your Dog to Work Day! Meet Lambeau, a sweet, black Labrador, and Ziggy, an adorable rescue dog.